Chichen Itza, Yucután, Mexico - December 21, 2012. Onlookers were shocked and terrified this morning when the Kukulcán pyramid at Chichen Itza began to rotate, spin, and open up like a gigantic puzzle box. For moments, the six tourists then visiting Chichen Itza feared that this event was a portent of the much-advertised 2012 apocalypse. 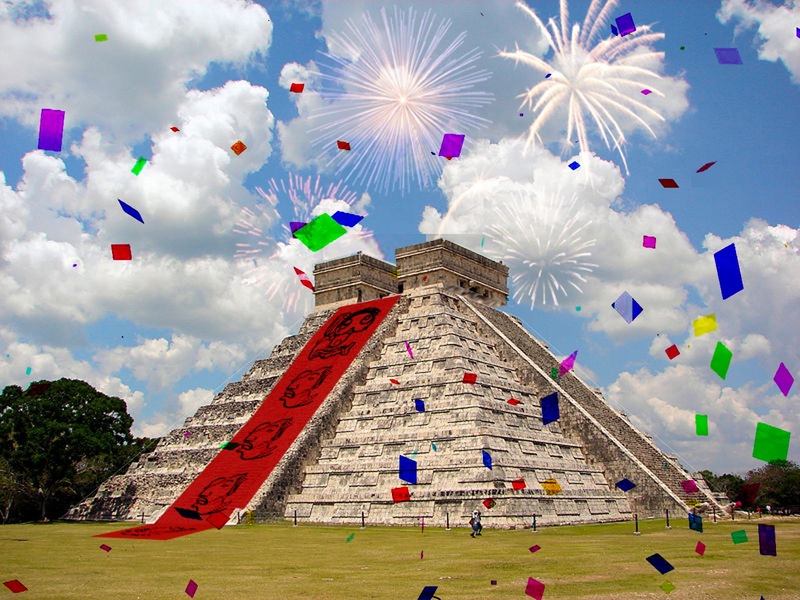 Then the massive pyramid began to emit fireworks and confetti, as well as play catchy music using an intricate system of bells and whistles that had apparently been built inside. A few minutes later, a large Maya-language banner reading, "Happy New B'ak'tun!" rolled down the steps of the pyramid, capping off an overture that would have announced the changeover from the Mayan Calendar's B'ak'tun 12.20.20.18.19 to the much more elegant B'ak'tun 13.00.00.00.00. Because a B'ak'tun is a 144,000-day-long unit of time equal to 394.26 solar years in a base-20 number system, today's New Year's party, historians say, "Could have been the party to end all parties, with tens of thousands of participants uniting in the streets to celebrate —had the Maya culture not been actively suppressed by a steady stream of Spanish colonialists for the last 500 years." "Have you ever planned a great party only to have somebody come along and ruin it by converting all your prospective guests to Christianity and then all but erasing your civilization? Well this is kind of like that," archeologist Dr. Elena Feradas told reporters Friday. "Actually, no. Forget 'kind of,' that's exactly what happened," she added. At press time, the six tourists and the twelve ethnically Mayan people within driving distance of the pyramid have begun participating in a wild dance party after discovering several hundred casks of millennium-old spirits within the monument. Meanwhile many gullible internet readers hide under their desks in fear of end times that will never come. Both groups are among the lucky minority that have discovered something meaningful to occupy them on yet another dark day in this meaningless, empty universe. This is news in progress from This Is Art (In Progress).